Yesterday evening (September 21) Prince played the last mainshow and the last aftershow at London's O2 arena and Indigo2 club. What he did has probably never been done before and will stand as a fantastic achievement. He played an amazing 21 gigs at the huge O2 arena with more than 20.000 seats. Also he played at lot of aftershows following the main shows. Instead of touring Europe he let Europe come to the place of his choice turning London into a purple party-zone for 1 and a half month. I attended 3 shows and 2 aftershows and it was outstanding. 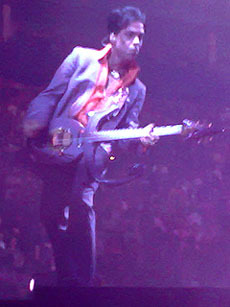 Prince has threatened to retire his old hits after this tour but I certainly hope he changes his mind. No one who attended these gigs will have any doubt that Prince's music has changed the world forever and no one can forget just how fantastic a musician and performer Prince truly is. Inspired by Prince's performances I have created a page where I've tried to compare Prince's album releases and rate them as well.